When explaining the role and importance of public health to my colleagues, I like to jokingly point out that, ideally, patients spend most of their lives outside of the hospital. Though my tone is sarcastic, my sentiment is honest. Most of what happens to people that keeps them healthy or makes them sick happens outside of the hospital setting. One’s habits, lifestyle, home and work environment, level of education, and financial means all influence one’s trajectory of health more strongly than most hospital-based care can. These social, behavioral, and structural determinants of health often make the difference between a person whose health will maintained outside of the hospital and a person who will require repeat hospital visits. The structural determinant of health that I will discuss in this post is one that I have confronted on a daily basis in the hospital – that of continuity of care, or barriers thereto. 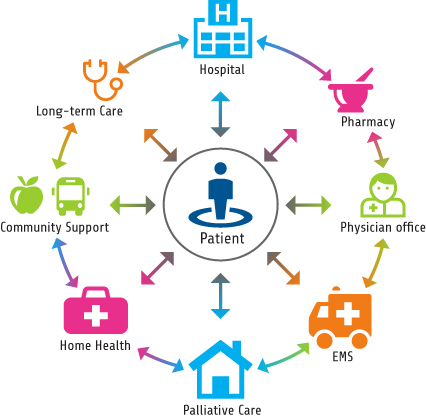 The fragmented nature of our healthcare system and the game-of-telephone-like way that information gets passed from one link in the healthcare chain to the next is a major reason that patients’ health and healthcare suffers from systemic discontinuities between hospital, rehab, clinic, and home or facility. The hospital is just one part of the health care ecosystem.